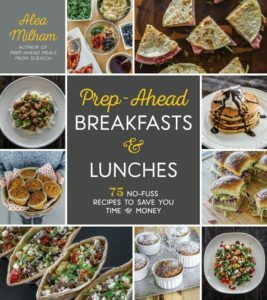 My new cookbook, Prep-Ahead Breakfasts and Lunches was recently released. Since I share some techniques, that while easy, are uncommon, I have created an online cooking class to demonstrate those techniques. In the Meal Prep Cooking Class, you will discover how you can make a week’s worth of breakfasts and lunches in record time. Cook, prep, and store your breakfasts and lunches even if you have never done meal prep before. You don’t need fancy equipment or expensive ingredients. In this cooking class, I demonstrate many of the techniques used in the cookbook Prep-Ahead Breakfasts and Lunches. You will have access to printable copies of all the recipes that are demonstrated in this course. You will also receive access to a private Facebook group where I will answer all of your meal prep cooking questions. You can see a list of the topics covered below. For a limited time, anyone who purchases a cookbook can enroll in the meal prep cooking class for free. 1. Buy a copy of Prep-Ahead Breakfasts and Lunches (I have listed where it is available below). 2. Fill out this form providing proof of purchase. After the form is filled out you will be given a coupon code. Copy the code! 3. 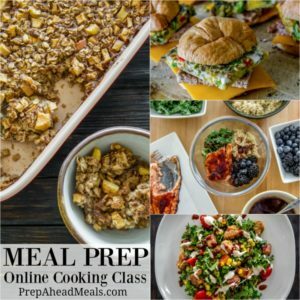 Find the Meal Prep Online Cooking Class here and add it to the cart. 4. Be sure to add the coupon code to the box on the checkout page and click “apply coupon” to receive the course for free. You will still have to fill out the form, but you will have a zero balance and will not be asked for any payment information. Using sheet pan eggs and sheet pan sausage to make breakfast sandwiches. How to make baked oatmeal. How to make blender pancakes. How to make overnight granola. 3 ways to used scrambled eggs in make-ahead breakfast dishes. Batch cooking primary ingredients for quick meal prep. 3 Ways to make meal prep lunch bowls. 3 ways to make meal prep salads.